Our whisky takes the finest single malts, many from Speyside, matures them in American bourbon casks and Spanish sherry butts and blends them with Scottish grain whisky. Golden and mellow, there is silky, spicy richness on the palate and a classic, well-blended finish. Three Year Old, Blended Scotch Whisky, Rich and Warming from Scotland. A classic Scotch, made with the finest single Malts, matured in American bourbon casks and Spanish sherry butts and blended with Scottish Grain Whisky. 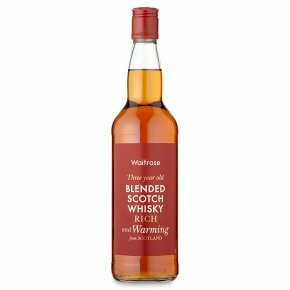 The taste...Rich, mellow and warming a well balanced award-winning whisky with flavours of spice and honey. Try it...Splashed over ice or mixed with ginger wine for a Whisky Mac.